is such a life-like statue, that for me, it's a little creepy. greets all the Twins fans at the door. born on this date is a laugh and a love a day. How cool that there is a statue commemorating Calvin's life. Yes it really is an honor, especially since he sold the team years ago and the new owner put up this statue after his death. Far out and a happy December 1 to you, Bish. That is awesome indeed, maybe you can get some voodoo going and bring it to life haha hey it worked for mannequins in a movie, why not statues. Astrology though, I snicker at that. Astrology is going to come and zap you in the bud. There are three Sagittarius birthdays in our family. Makes Christmas busy. Amazing statue of your Canadian husband. Wonderfully placed. But I can imagine it could be a little spooky. And you're selling your Christmas ducks are you? Must too cold for them to be outside. Blessings and Bear hugs, Manz! I gave up on the ducks. They get frozen in the water and I have to chop them out and they fly away. It was 10 below when I got up this morning. It's difficult not to get on well with Sagittarius. They are such fun-loving people and have a wonderful happy personality. My brother's birthday is today. December 1. He is VERY Sag. Likes to laugh and love... sounds a lot like your husband, minus the avid interest in baseball. We are meeting him and his wife in Orlando this afternoon and spending the week together. This is the first time I've spent his birthday with him in MANY years. I'm really looking forward to this vacation. It's been almost 14 years since Calvin died and memories do fad. Many years his birthday goes by and I never notice. But somehow, I woke up this morning, went to the computer and reallized it was Dec l. That did bring on a rush of memories, so I wrote the post. Thanks for dropping by. I think of you often. You are right as that is such a life-like image of him that I really can't look at it. He would have been pleased that the present owners brouht this honor to him. Maybe he knows. How magnificent. You must be very proud, Manzanita. 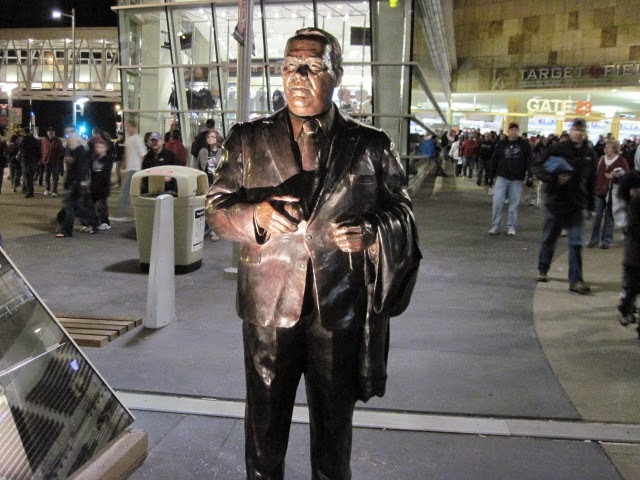 That's wonderful a statue of him in front of a venue where they play a game you love . Oh, Manzi, that is such a great tribute to your spouse! I am associating with what your other guests had said! And... Happy Birthday to Mr. Calvin! Thank you. Yes, it really is a wonderful tribute to his years of devotion to the sport but nevertheless, it gives me a lonely feeling. All the fans can go home but he still stands there in the rain or cold. It's like a double-edged sword for me. That's how I feel about most Sagittarius too. My youngest son is a Sadge and he too is the jovial sort and has more friends then I could accumulate in a lifetime. Wow! That is quite something. Happy birthday to him. Yes it is an honor to his memory. Thanks for visiting. Wow!! born the same year as Griffith Stadium. Quite a baseball family. You hit the double nails. Seeing the statue does make me a little sad. You would have like to talk baseball with him as I know what a bb fan you are. He lived and breathed baseball all his life. Happy Birthday and RIP to your husband. A lovely tribute. Thank you for visiting and leaving the nice comment. Happy Birthday to your husband, may he rest in peace. Wow. You were married to a man who was important enough to have a statue! I didn't know you were such a wheel. Sometimes life is just a Hallmark Christmas movie, isn't it. LOL You always make me laugh, Al. I feel I knew him... through your eyes. I even ate out of his Minnesota Twins Bowl. Can't remember if it was the sweet potato soup or what. That is right. We used the Old Stadium dishes for the sweet potato soup. It was delish. Thank you for coming to see me and for being such a good friend and for all the things we shared. I raise my hat for the both of you. I bet you can't do the polka for an hour to the "Blue Skirt Waltz." Thank you, kind man, for the hat raise and I return the gesture with playful youthful exuberance. Not my birthday yet, but I'm a Sadge, too. Lucky fun-loving you. So it my son's birthday coming up but kinda near the end. He may have some Capricorn sneaking over into his chart. He loves his social time and is constantly hosting parties but now that he is older, he also takes his work very seriously. I'll look on FB to see when yours is. Happy Birthday to your Mister. I always take joy in learning another Sagittarius. Your husband owned the team? Good gosh! What a life you and he had!